Oh. The first letter of each item spells out “dicktits”. Well, that’s just great. 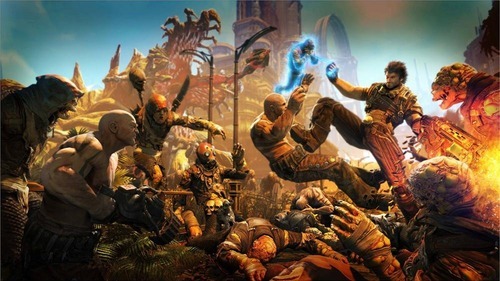 Now that Bulletstorm has officially made fun of every competitor’s successful FPS franchise, I’m thinking that the game proper needs to hit it out of the park. It’s easy enough to make fun of CoD and Halo, but if you don’t deliver, you’ll be laughed out of the next E3. What do you guys think? I just played this and it was hilarious. Sergent Of the Master Sergent’s Most Important Person of Extreme Sergent’s To The Max!!! I find this so funny because this is how most 1st person shooters treat you and they feel like they have to hold the gamers hand all the way through. Haha, making fun of CoD and Halo is fine, but don’t pick on Fallout3, easily a remarkable game that did enough new (when it had to) and hasn’t been copied (as far as I know) so far. Even though I’m Canadian, taking a shot at American troops with the thumbs up flags/fireworks isn’t cool. Soldiers might be used a lot in video games, but that doesn’t mean they’re fair game to be poked fun at when you’re still making a game about shooting bad guys. I played this earlier and found it pretty hilarious. Looking forward to Bulletstorm.